Jimmy Cricket had a busy weekend of shows in which he performed alongside a Rod Stewart tribute act and also presented some dance awards. The famous comedian was at the E57 Club in Birmingham on the night of Saturday 17 November and then the following afternoon, he performed at the Eric Morecambe Halls in the St Albans City district of Hertfordshire. Jimmy Cricket worked again recently with someone he describes as a “showbiz legend”. 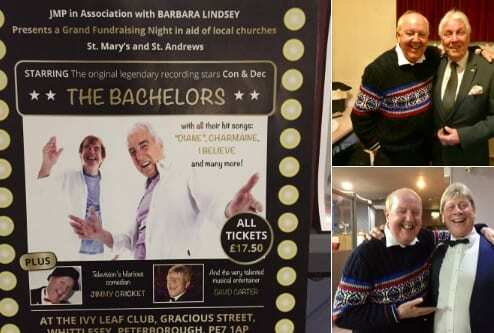 The Northern Irish comedian was performing on a show at the Ivy Leaf Club in Whittlesey, Peterborough on Friday 19 October, which was organised by Johnny Mans and his production team in association with Barbara Lindsey. Johnny is the third generation of a showbiz family with his grandfather being a Yorkshire comedian and his grandmother a dancer with the Tiller Girls, a popular dance troupe famous for their high-kicking routines and who once counted former House Of Commons Speaker Baroness Boothroyd as a member. His mother also became a Tiller Girl, as well as being a pantomime producer and a dance school teacher. Johnny’s six sisters were professional dancers, one of them touring with Arthur Lucan (Old Mother Riley) and another in Kirby’s Flying Ballet. Johnny performed in his mother’s pantomime productions from the age of eight and after several years he developed his own comedy act and became one of the famous Carroll Levis discoveries, appearing on television from the Aston Studios in Birmingham. Over the years Johnny appeared in theatres with star names of that era, including the famous American comedy duo The Bernard Brothers. He also worked with Derek Roy, Jimmy Young, Marty Wilde, Ronnie Hilton and for a while joined the holiday camp world, first as a Redcoat and then a short spell as a Bluecoat, becoming an entertainment manager at the age of just 21. The world of clubland also beckoned and he performed throughout the UK. After five summer seasons in Jersey in various productions, he eventually turned his hand to producing his own shows, being an agent and manager and also a concert promoter. Since the early 1980s, he has been a prominent name in the entertainment world, having managed major stars such as Sir Norman Wisdom, Anne Shelton, Max Bygraves, Danny La Rue, Nicholas Parsons, Jon Pertwee and many other celebrities. He has also produced and promoted shows for big names such as Des O’Connor, Cilla Black, The Platters, Bob Monkhouse, Val Doonican, Suzi Quatro, Little & Large, Tom O’Connor, John Inman and Dame Vera Lynn. In 2009 he took over Encore magazine, printed every two months for the entertainment industry. Charity is also a major part of Johnny’s life and over the past 40 years he has been involved with many fundraising organisations, including the Entertainment Artistes’ Benevolent Fund (now the Royal Variety Charity), the Roy Castle Lung Cancer Foundation and the British Heart Foundation. Johnny, who is also a family man, has produced shows at Buckingham Palace in the company of several members of the Royal Family. 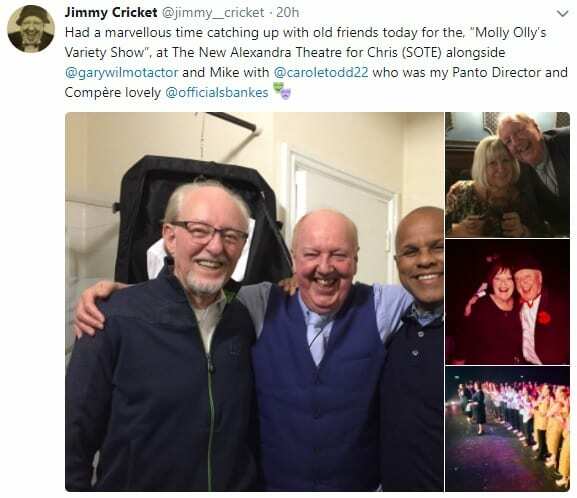 A variety show in Birmingham in aid of Molly Olly’s Wishes starred West End and TV star Gary Wilmot, comedy legend Jimmy Cricket and several variety acts. 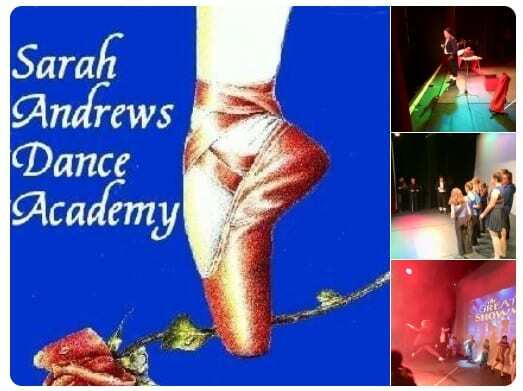 It was the second charity gala night at the New Alexandra Theatre, in support of children with terminal or life-threatening illnesses and their families. Other acts included BBC’s Pitch Battle Solihull Choir Crescendo, ventriloquist Max & Friends, and mind games with magician Mark Williams. The show was again hosted by Sally Bankes and directed by Carole Todd, with all proceeds going to Molly Olly’s Wishes. 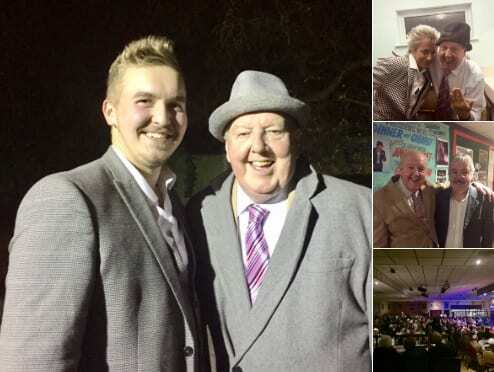 Famous Northern Irish comedian Jimmy Cricket had a busy weekend with three shows in three different counties. The popular 72-year-old entertainer was in Greater Manchester on Friday night, Hednesford in Staffordshire on Saturday and then Sunday saw him performing in Birmingham, West Midlands. 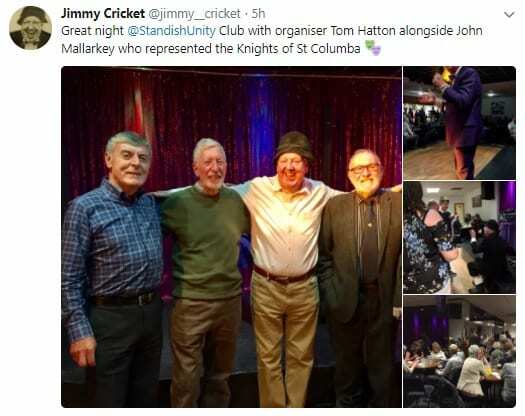 Rochdale-based Jimmy was first at the Standish Unity Club in Wigan, before moving on to Hednesford Ex Serviceman’s Club in Cannock, – an event that had been rescheduled due to the bad weather. The weekend was rounded off by a show at the New Alexandra Theatre in Birmingham, a charity evening in aid of Molly Olly’s Wishes. Jimmy Cricket is appearing in a show in Birmingham later this month in aid of a children’s charity. A Variety Performance will take place on Sunday 29 April (7.15pm start) at the New Alexandra Theatre and also features West End & TV star Gary Wilmot in addition to a host of other acts. The charity gala will raise funds for Molly Olly’s Wishes, which supports families of children with terminal and life-threatening illnesses. For more information and to book tickets, visit here. Will the real Jimmy Cricket please do stand-up?! Jimmy Cricket has been telling the true story of what happened at BJ’s Bingo Club in the Kitts Green district of Birmingham recently. The famous entertainer had arrived at the club ahead of his performance there when a woman approached him and said: “You’re not the real Jimmy Cricket?”. Jimmy, 71, relates the tale in his latest column in the Preston-based Lancashire Evening Post newspaper. And he also talks about a mysterious ‘Mr X’. Click on the image above to read an expanded view of the full article. Jimmy Cricket was given a fabulous reception at two shows during the last weekend of January. 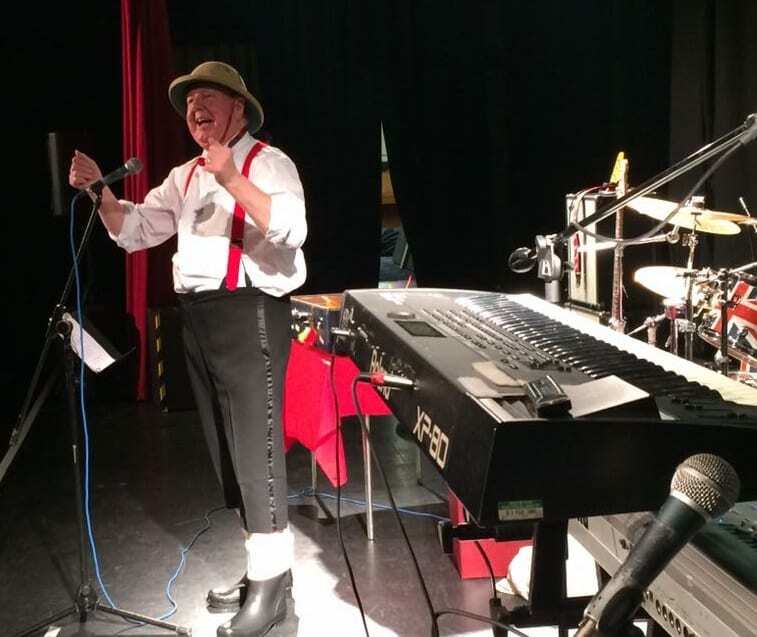 On the Friday, the 71-year-old popular entertainer was invited to perform at the Mayor of Rochdale’s charity gala at the Heywood Civic Centre. The event was organised by his friend of many years, Cllr Peter Rush. Appearing alongside Jimmy was John Stokes’ Bachelors, comedian Dusty Young (who compered the proceedings), and the band Carnaby Street. It was staged in the presence of this year’s Mayor of Rochdale – Cllr Ray Dutton. All the proceeds from this special night of entertainment went to local Rochdale and Heywood Charities that are supported by this year’s Mayor. 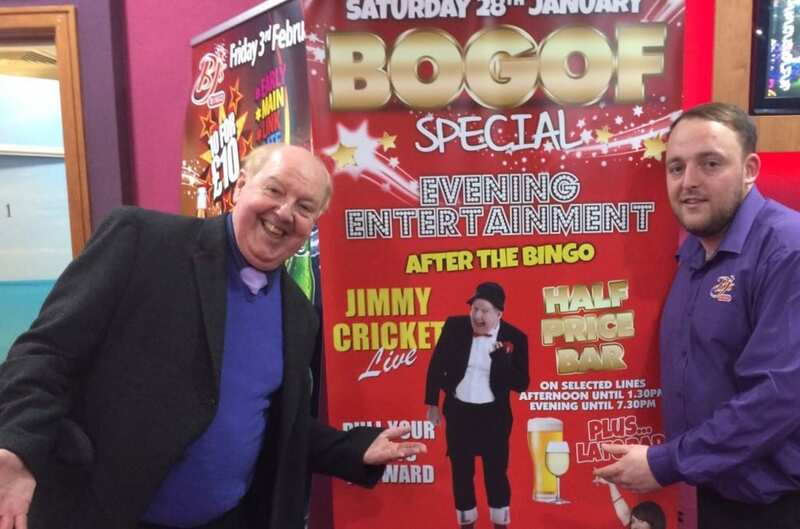 The next night, Rochdale-based comedian Jimmy was down in Birmingham where he appeared at the BJ’s Bingo club (poster for the event is below) in the Kitts Green district of the city. This was the second BJ’s Bingo club Jimmy had visited in six months, as he was at their venue in Leigh last October. Many thanks must go to the Birmingham general manager David Cooksley for arranging Jimmy’s visit. Famous actor and comedian Johnny Vegas is to appear in the Womble movie, which is being filmed on location in North Wales and also features entertainer Jimmy Cricket. St Helens-born Johnny is well known for his appearances in the hit ITV comedy drama Benidorm and also for popping up in adverts for tea brand PG Tips with a stuffed puppet monkey! His addition to the cast is another major coup for the people behind Womble the movie, as it also includes top comedian Jimmy, 69, who will play himself as a talent contest judge. 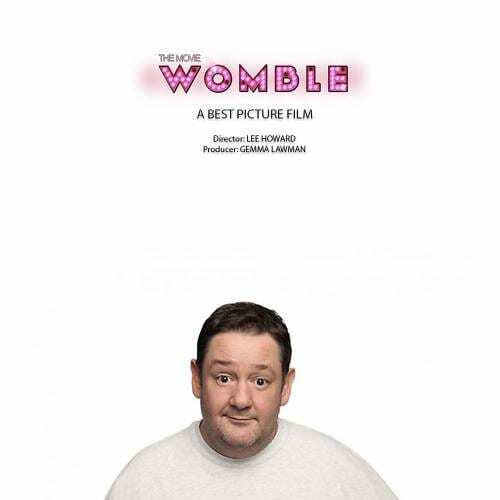 The film is about a man called Aloysius Rupert Womble (played by actor and comedian Tom Spencer), who is in his 30s and living with Asperger’s Syndrome in a typical seaside resort town. The film will feature songs from the Beautiful South’s former lead singer Briana Corrigan and American Pie star Thomas Nicholas, as well as a string of original songs written by songwriters especially for the movie. Jimmy Cricket says he is looking forward to his role as a talent show judge on his forthcoming silver screen debut. 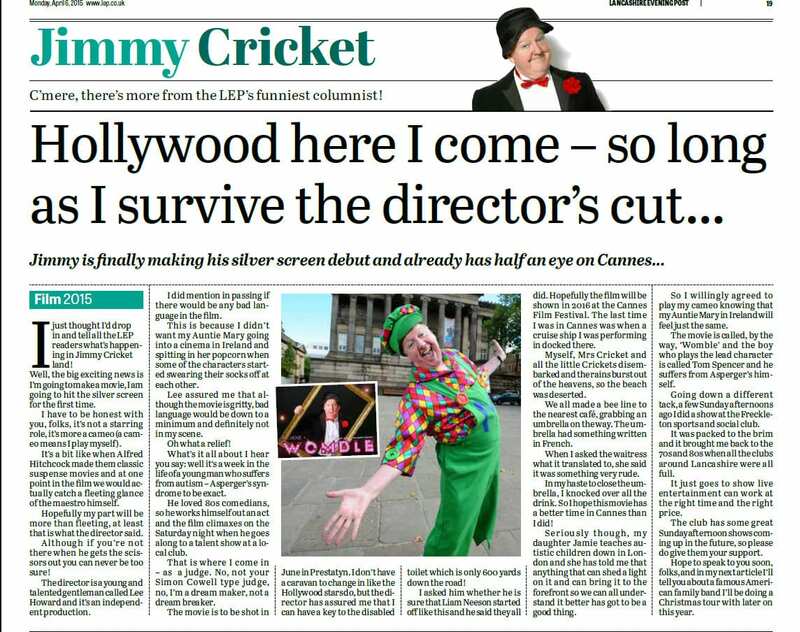 But the famous veteran entertainer insists he will not be like Simon Cowell in The X Factor, telling readers of the Preston-based Lancashire Evening Post in his monthly column he will be a “dream maker, not a dream breaker”. Womble, one of the biggest independent movies to be made in North Wales, is being shot over the summer and will be set for release in 2016. It is about a man called Aloysius Rupert Womble (played by actor and comedian Tom Spencer) who is in his 30s and living with Asperger’s Syndrome in a typical seaside resort town. 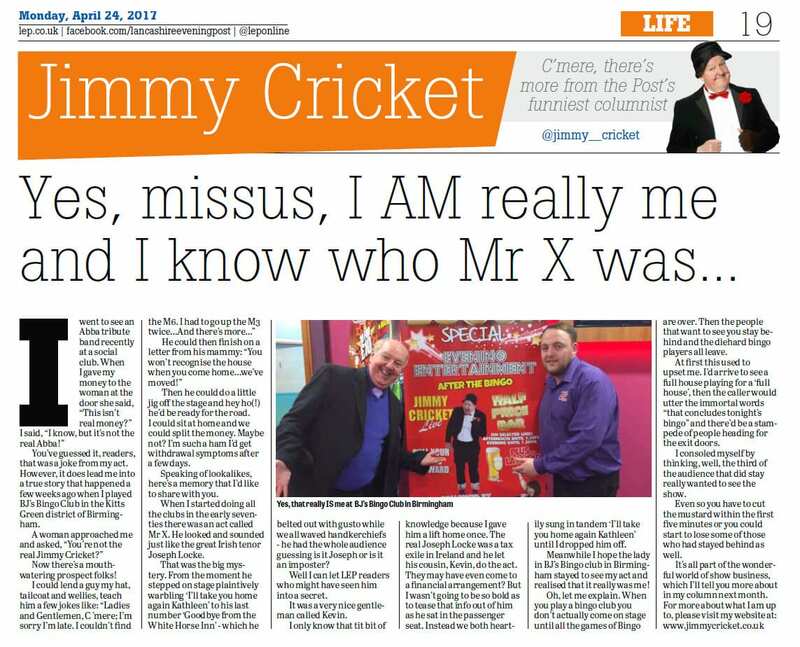 Jimmy Cricket recalls in his latest newspaper column the time he nearly met a footballing legend. 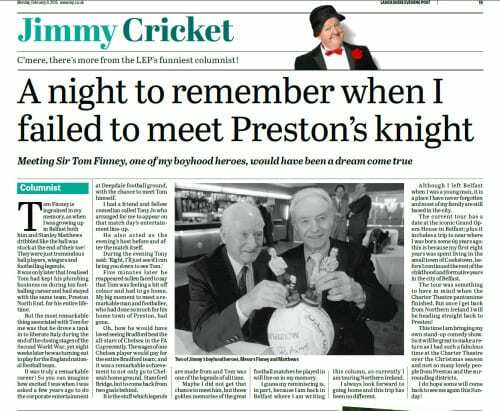 The well-known comedian says in the Lancashire Evening Post that he was asked to do the corporate entertainment a few years ago at Deepdale, home of Preston North End for whom Sir Tom Finney made 473 competitive appearances, scoring 210 goals. Tony Jo, a friend and fellow comedian, said during the evening that he would go and get Sir Tom so Jimmy could meet him. However, Sir Tom was not feeling too well and had to go home early. Sir Tom, who scored 30 goals in 76 appearances for England, died 12 months ago aged 91.